Welcome To Newbury Park Orthodontics, Office of Dr. Cory Hoffman! Thank you for visiting our website at Newbury Park Orthodontics. Dr. Cory Hoffman and our friendly, professional orthodontic team are dedicated to providing the most comprehensive, technologically advanced orthodontic care for patients throughout Newbury Park, Thousand Oaks, Moorpark, Camarillo and the greater Simi Valley, CA area. We pride ourselves on being a practice that embraces technology to help us better serve our patients. Our office is inviting, modern and equipped with our own digital imaging lab and advanced 3D imaging technology, making our brand of orthodontic care more efficient and effective. Please, explore the rest of our website, take a photo tour of our office, learn about our treatments and visit us on Facebook, Google +, Yelp and our Blog to share your experiences and see what we are doing in our communities. Early childhood orthodontics and two-phase orthodontics. Traditional Braces and Lingual Braces. One aspect of orthodontic treatment that is often dreaded is the impression process. Impressions are when your orthodontist creates molds of your teeth to customize your treatment plan. Typically, this is done with orthodontic putty that is applied to your teeth and left to set, causing a messy, uncomfortable experience. Newbury Park Orthodontics has done away with the messiness by embracing the power of technology with the iTero Scanner. 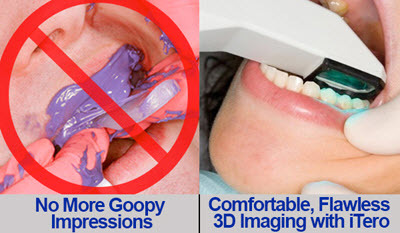 The iTero scanner is a wand that is simply passed over your teeth, generating a computer-based 3D image in real time. This technology eliminates the use of messy, goopy putty, creating a painless, comfortable experience that never requires a redo. Simply put, this technology makes orthodontic treatment better by creating efficiency and accuracy from the start. We are thrilled to offer this service to our patients. To learn more about the iTero scanner, watch the video below. If you have any questions about orthodontic treatments, braces, Invisalign or simply need to schedule an appointment, don’t hesitate to contact us today. Dr. Hoffman and our team are always here to help you and your family achieve the healthiest smiles possible. Thanks!